Here is a quick little painting I did for my husband for our recent anniversary. He’s a huge fan of bees and dreams of having his own hives one day. 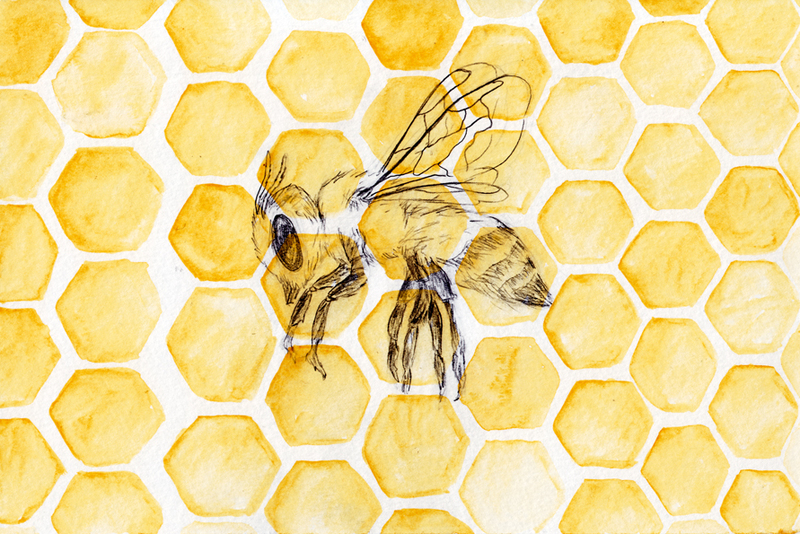 I drew the bee in pencil and then painted the comb right over the top. This is available as a print in my Print Shop. 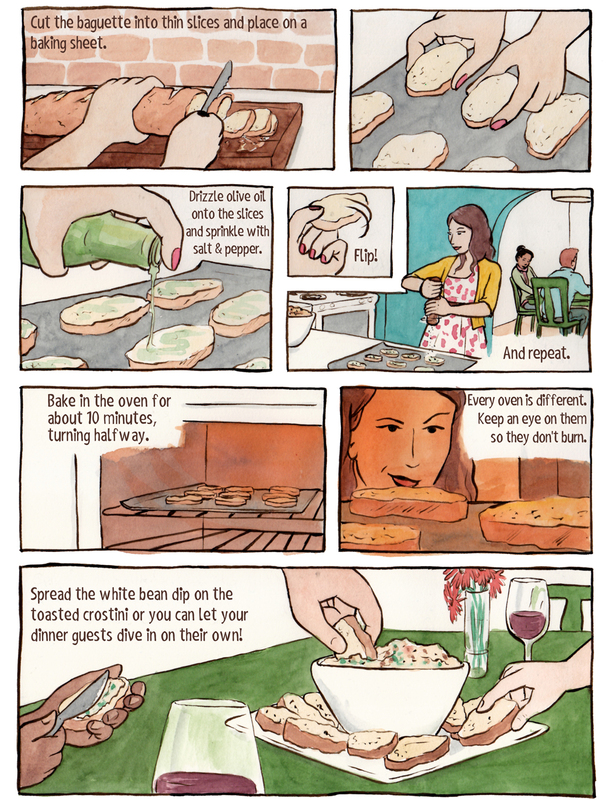 Over the weekend I did a new recipe comic for Herbed White Bean Dip with Toasted Crostini. This is a really great recipe when you’re having some friends over and it’s something a little different than, say, hummus or spinach dip. Trust me, with the bacon mixed in, this won’t last long. I have been working very hard the last few weeks and months to up my illustration game. I’ve been pushing my composition skills and experimenting with new techniques and this is another piece that has come out of that experimentation. I was inspired to paint this by my little sister who is having a baby next month and moving to their new house next week. 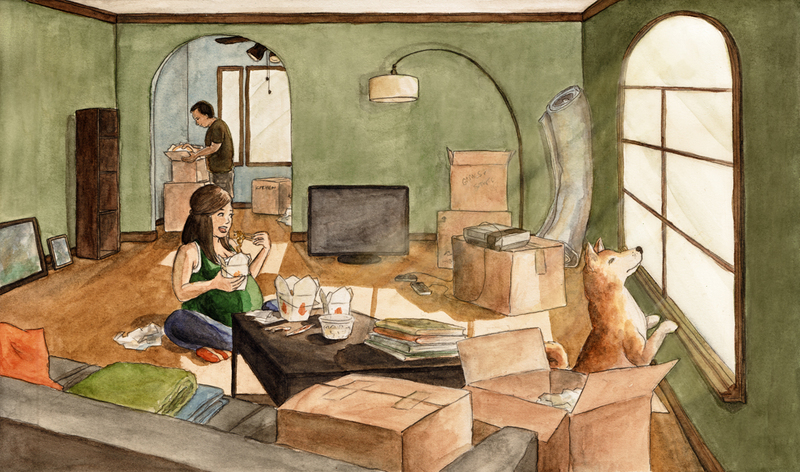 I particularly enjoyed painting the food and containers on the coffee table and the Nintendo sitting on top of a box. These little details can really make a big difference and they’re fun to draw. 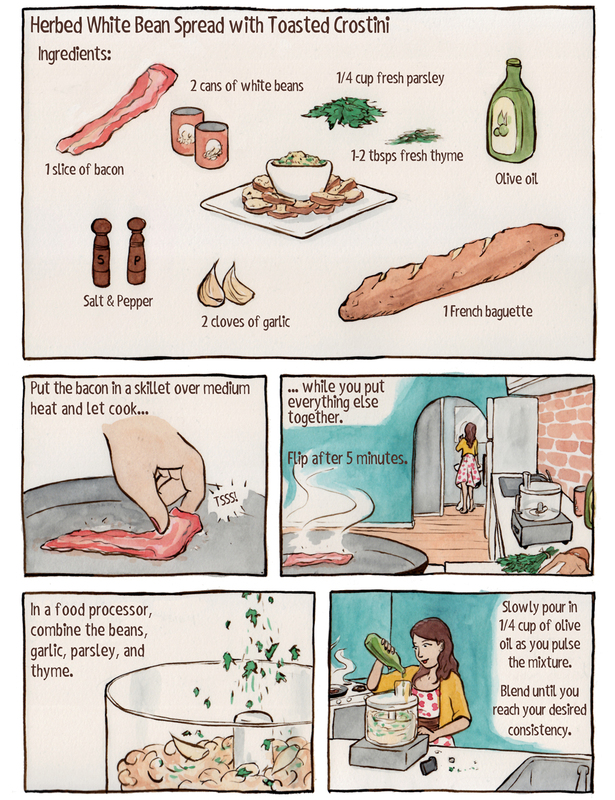 I was thrilled when Alisa Harris over at Cooking Up Comics asked if I would like to contribute a guest recipe to her blog. The recipe went up early this morning and now I can finally share it with you! Alisa’s blog is an all vegetarian (often vegan) recipe comic blog and she has been posting comics of her own for some time now. They are always fun recipes and I encourage you to check out the rest of them. 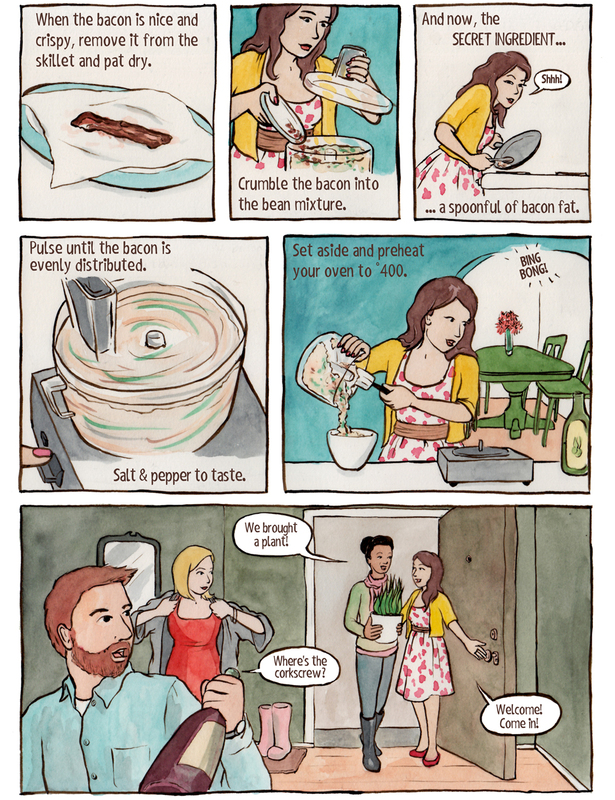 I loved creating this recipe comic and I hope to do more of them in the future. Illustrating food is something I really enjoy so for any of you out there that have a food project you need illustrated, let me know! Sheesh, I just realized that my last blog post was from the 27th of February! Talk about getting behind. I apologize for the relative silence. I’ve been doing a lot of traveling and work has been very busy. Naturally, that means I’ve been doing a lot of client work that I can’t share and haven’t had much time for other stuff. 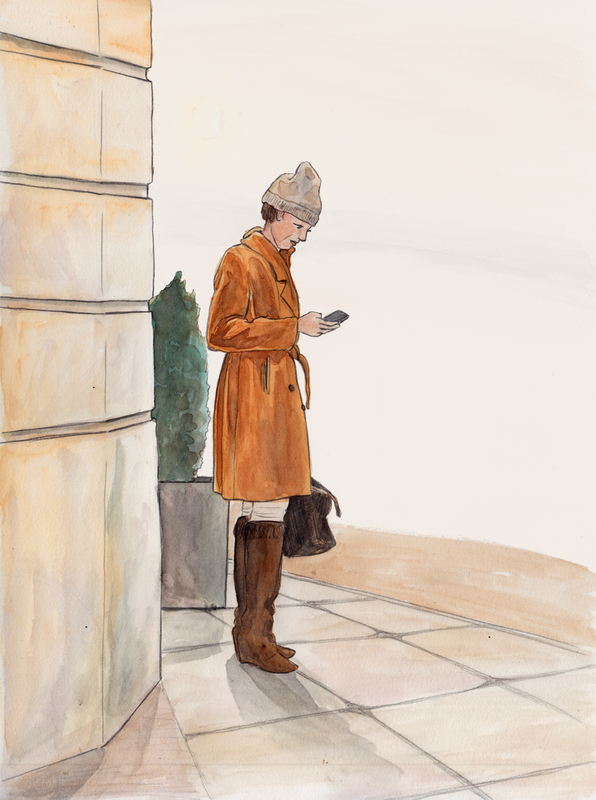 Though, if you follow me on Instagram you can see a lot more of my sketching/painting. So this is one of my latest watercolor paintings. I am currently obsessed with using my one Kuretake waterbrush pen. It’s made mostly for painting on the go, but I also really like it for my other painting except that it’s a little small. There is a line of about 4-5 of them and I’d love to get them all. I feel like it gives me more control over how much water I put on the page and it has such a smooth feel. Not to mention the portability factor. Anyway, after reading Glyn Dillon’s The Nao of Brown, which is a gorgeous book that you should all read, I decided to try painting with watercolor over pencil. Dillon creates his comics in pencil but then prints the pencils onto watercolor paper so I was just sure that painting directly over the pencil would lead to a smeared lead distaster but it didn’t. Lately, I’ve been feeling like my process is too complex – I draw each illustration in too many stages and the resulting image can be stiffer than I intended. So by using pencil as the final drawing stage I get to leave off one round of redrawing. I do still love inking, though and I will probably go back and forth between the two techniques. And if you didn’t noticed, I added a Print Shop tab to the navigation on my site. If you’re looking for prints of my work, hit it up!